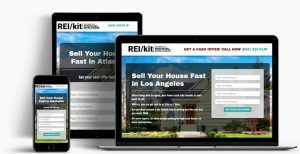 The launch of Lead Pages in REI/kit, was an instrumental piece of the deal creation machinery to ensure your lead generation techniques keep up with the times and give you an always on channel for motivated seller leads. In this update I’ll cover some of the questions that I am most often asked when it comes to the Lead Pages feature. What are lead pages and how are they different from a regular web page? Why lead pages are a necessary component of your marketing strategy in 2019? The science behind REI/kit lead pages. How you can build your first lead page in REI/kit in just 2 clicks. A lead page, also known as a “squeeze” page, is a page on the internet that has only one goal, and that is to get the person visiting the page to submit their contact information via a lead form. You may have even submitted your own information to such “squeeze” pages before, for example, to download a special report or checklist to help your business. Think about what it took to get you to submit your information to that page. You had to really want what they offered, to give up your email address, right? That’s why these pages tend to be highly effective, because there is only one action for a visitor to take, and that is to figure out if the solution offered is strong enough to submit their information, or leave the page. That’s it. In the case of REI/kit Lead Pages, the desired outcome is for a distressed seller — someone motivated enough to be actively searching for a solution to their problem on the internet — to visit your lead page and submit their information to you. Lead pages are high-intent, meaning that visitors to your page already know what they need and are primed to take action. I built REI/kit Lead Pages to take advantage of that high intent, and take your leads all the way through the end of that journey where you capture their information. Why are Distressed Seller Lead Pages an essential component of your marketing strategy? There are a LOT of ways to market and locate off-market and wholesale properties such as direct mail, driving for dollars, emailing and cold-calling…so why do you need lead pages? The fact of the matter is that, going into 2019, marketing to only one channel is just not going to cut it anymore, and the name of the game is the omnichannel, or omnipresent marketing approach, orchestrated to send the same brand message everywhere that your customers are. To put it simply, ALL of those lead channels I mentioned above are important, and to rise above the noise you need to be seen everywhere to be able to grab the attention of anyone today. In fact, these days a customer has to see your brand at least 9 times before they will purchase your product, and this is up from 7 times just a few years ago. This means that your target customer has to see you in their Facebook feed, in their Google search results, in their email, on a billboard, on telephone poles, in their voicemail. Everywhere they are, you are. Bringing it back to lead pages, this is one vital component of that lead generation strategy, a way to reach more people by providing “always on” marketing. …And of course, the best part of online marketing lead pages is that after you market them to bring distressed sellers or cash buyers to your page, they work for you even while you’re sleeping. What’s better than waking up in the morning, signing in to your brand spanking new REI/kit Seller Leads CRM, and seeing a fresh list of motivated seller leads ready to follow up with? But, not every lead page is created equal. Let’s talk about conversion optimization for a moment…. To get a distressed seller, from visiting your lead page, to actually submit their information to you, you have to overcome a trust barrier. The flow of the page has to have one goal in mind, and that is to capture their information. This is why, for example there are no other menu links on the page, there is no way off the page, forcing your visitor to make a decision based on all of the other trust signals. This is also why there is a ‘call to action’ to give you a phone call between every single section. With that in mind, your page has to look professionally made, indicating that you are a legitimate business that has been successfully helping many people for a long time. Your content has to speak to your customer, in their language, to make them feel like you understand their pain. It has to describe their immediate pain, and provide a solution, in your case, a cash offer. Out of the box, the pre-generated content for your lead page touches all of those points, but it is completely customizable by you to your business and your market. Testimonials are an essential trust signal, and you can add 3 of your most powerful testimonials to your lead page on REI/kit. Google Chrome now shows a site as “Not Secure” by default if that site is not using https. That one simple indicator is a huge trust killer in the eyes of someone who is experiencing financial distress. In your visitor’s mind they think: If Google says that the site is not secure, is my information secure? “Not Secure” is not an option on REI/kit, and your lead page is always served with a secure certificate. For every second your page takes to load, you lose a significant percentage of your visitors. We started with the design requirement to load the page in about half a second, ensuring that you don’t lose a single visitor to your page. With at least 40% of your traffic being mobile, and with Facebook, that number increasing to 95%, if your lead page doesn’t scale to the device on which your customer is seeing it, you might as well forget any conversions from those customers. Your REI/kit lead page scales flawlessly to every device, especially mobile, making sure that you will capture every single lead. All of these attributes are done for you out of the box, without you needing to think about any complicated set-up, technology, or design, or conversion rate optimization. Just start marketing your pages and we’ll handle the rest. So how can you build your first lead page in 2 clicks? Two clicks and you’re done! You can create as many of these pages as you want. Other lead page creation websites cap you at 3 pages for their mid-tier pricing. I decided not to put a cap on the number of pages because I recognized that the reality is, real estate is local. For example, I’m not just in Los Angeles, I’m also in Eagle Rock, Pasadena, Hollywood, Atwood Village, Boyle Heights, and many more locations. The same goes for you and your market. You need to be able to speak directly to your customers, neighborhood by neighborhood, and I’m going to help you do it, whether it takes you one lead page, or one hundred. Remember how important it is to be omnipresent? You’re going to nail your presence with these lead pages.